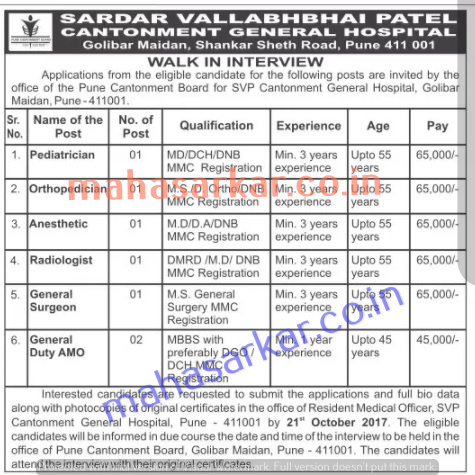 SVP Cantonment General Hospital (Sardar Vallabhbhai Patel Cantonment General Hospital), Pune Published Job Notification for 07 Assistant Manager Posts. Candidates who wish to apply must look at SVP Cantonment General Hospital Recruitment 2017. Eligible candidates can apply offline before 21st October 2017. Education Qualification: MD/DCH/DNB/M.S./DA/DMRD/MBBS and More. For Post wise Education Details follow the detailed advertisement. Interested & Eligible candidates can send their application along with all the necessary documents and testimonials to Resident Medical Officer, Sardar Vallabhbhai Patel Cantonment General Hospital, Opposite Golibar Maidan Camp, Shankar Sheth Rd, Katad Khana, Pune, Maharashtra 411001. Starting Date, Last Date to Apply offline at Sardar Vallabhbhai Patel Cantonment General Hospital which candidates should be remember as follows. Start Date to Apply offline: 17th October 2017. Last Date to Apply offline: 21st October 2017.